If you are in the market for both a 12-inch miter saw and a miter saw stand, HomeDepot has quite the deal for you. For a limited time they have paired up the Ridgid MS1290LZA Sliding Compound Miter Saw w/ Laser and the AC9945 Miter Saw Utility Vehicle (MSUV) stand for only $499. The saw regularly sells for $499 and the MSUV normally sells for $199. A savings of $199 isn't bad. A reader sent in a tip about some sweet Free Bonus Tool promotions (with purchase of select Cordless Combo Kits) going on at HomeDepot. 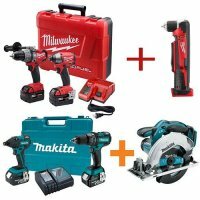 Initially we thought the promotion only applied to Makita and Milwaukee Tools, but it turns out there are DeWalt, Ridgid, Ryobi and Bosch deals as well. 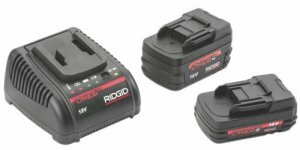 Ridgid has announced their next generation of 18-volt lithium-ion cordless tool batteries in 2.0Ah and 4.0Ah, and promise improved performance, longer runs times and other advancements over previous batteries. 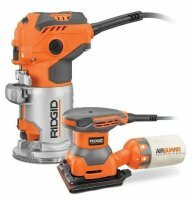 The JobMax is a tool that Ridgid makes that features a corded or cordless body that can accept interchangeable heads. The System has been out for a while now, with improvements and attachments coming along the way. Now it appears the next step for the JobMax system is to go pneumatic. There have been a few small portable table saws on the market over the years, but DeWALT started a whole new table saw class with their DW745 Compact Table Saw. Following shortly after DW, with a saw of their very own, Ridgid came out with the R4516 Compact Table Saw, though it's life was short lived. But now after a few years, it looks like the time for the Ridgid R4516 has come again. 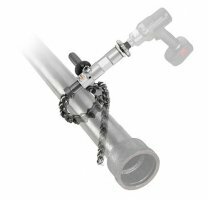 A good roller stand is must-have for anyone working with long or wide materials, and while the Ridgid Flip Top stand doesn't exactly 'roll', it has a unique design and some great features that make it one of the best portable out-feed stands I have used. Because of the features offered in the Ridgid Flip Top Stand, it was an obvious choice to make it a Tool-Rank Pick.